Who doesn’t love quick meals, especially meals cooked in one pan. This breakfast casserole has all the good stuff you love, like bacon, and all the stuff that’s good for you like spinach and eggs. Throw in ingredients you probably already have stocked in your refrigerator, and this casserole will sure go over well with everyone in your household. Did I mention that it ‘s also the perfect way to use up any left over veggies before they go bad at the end of the week? Well it does! Think of it as an easy way to clean out that veggie drawer in the fridge before going grocery shopping on the weekend. Lightly grease an 8 x 8 glass baking dish or pan with cooking spray, set aside. Place a non-stick skillet over medium heat. Add olive oil and onions. Let onions cook down for 2-3 minutes tossing frequently to prevent burning. Once they begin to turn translucent, add turkey bacon and cook for another minute. Add spinach, mushroom and garlic powder to the pan, cooking for another 2 minutes until spinach has wilted and mushrooms have gotten soft. While mushrooms are cooking, whisk together eggs with salt and pepper in a bowl then set aside. Remove skillet from heat and scrape veggies into bottom of greased baking dish. 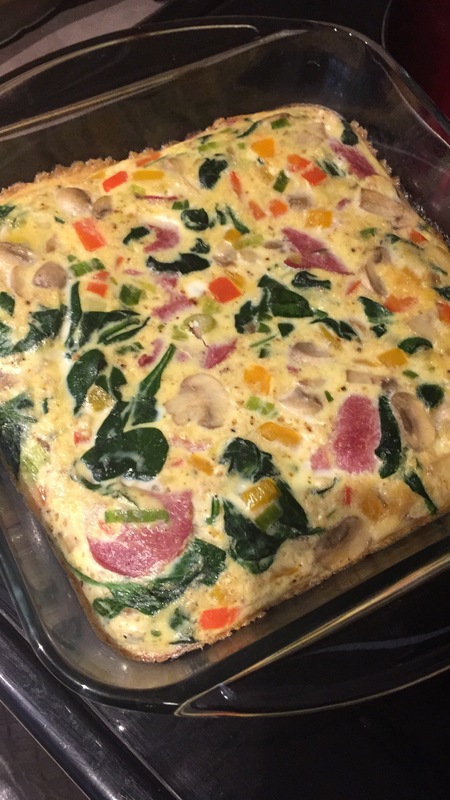 Pour egg mixture over veggies then place dish in the oven to bake for 15-20 minutes until the middle is set. Alternately: Use an oven proof non-stick or cast iron skillet. Follow steps 1 & 3-5 then pour egg mixture over veggies in skillet and place in the oven to bake for 15-20 minutes until middle is set.